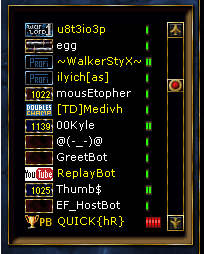 Custom client tags (aka “icons”) are small images that appear next to player names in the channel userlist on the server. They originally indicated what client a user was connected with (e.g. Warcraft II, Starcraft, Diablo II, etc.) but our server has expanded them beyond that — client tags can now be used to distinguish clans, bots, tourney winners, and so on. Don’t try to downsize a regular image to 28×14 because it’ll look like garbage. Your icon should ideally be pixel art which will still look nice when you zoom way in on them. 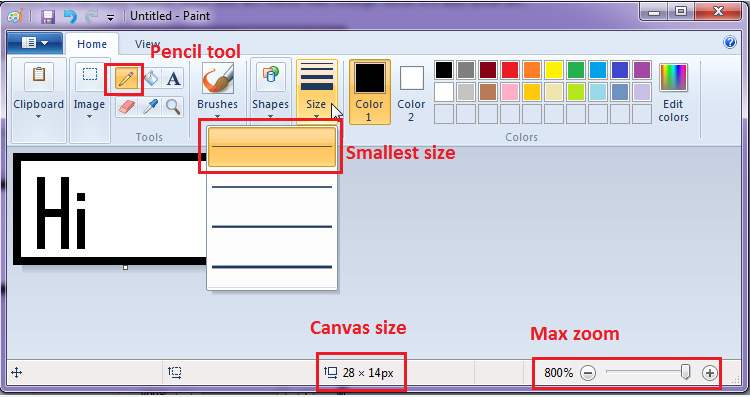 Set your canvas size (28×14) by grabbing the corner of the white square and dragging it to the correct dimensions. 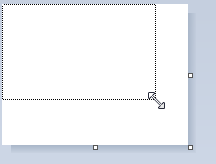 You’ll see the dimensions in the status bar along the bottom change in real time as you resize the canvas. Zoom all the way in with the slider in the bottom right corner. Use the pencil tool on the smallest size to draw your icon pixel by pixel. Copy/pasting regular images is bad because they end up really blurry. Certain colors don’t show up right on the server, especially certain shades of green, so try to stick with a few simple colors only. If you really want to use an image in your icon try WC2 unit sprites – they work well since they’re also pixel art. Avoid Orc units though because the green usually doesn’t display correctly on the server. You can also do a general search for sprites/pixel art. If you want to use any of tupac’s or War2.me’s custom icons (pictured above) that’s fine too, as long as they haven’t already been claimed by someone else.